This 48 minute Mitchell Falls coastal helicopter flight is a stunner! View remote untouched beaches & coves and the Majestic Mitchell Falls. The Mitchell Falls Coastal Experience. The Mitchell River has carved awesome gorges and magnificent waterfalls into the blocky, layered sandstone of the Mitchell Plateau. 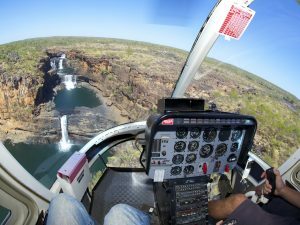 This helicopter flight over the Mitchell Falls and the coastline gives you the perspective of the land in relation to the coast and how the Mitchell River falls from the Plateau to the ocean. Enjoy close up views of the Mitchell Plateau and Mitchell Falls. Fly out to the waters of Admiralty Gulf and follow the stunning coast from Walsh Point to Crystal Head, spotting marine life in the ocean. Soar across to the Crystal Creek following the edge of the Mitchell Plateau and then glide over to Walmsley Bay. 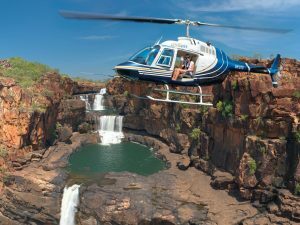 The helicopter flight path follows the Mitchell River upstream over the lower Mitchell Falls then continues upstream to the magnificent three-tiered Mitchell Falls and Big Mertens Gorge. This flight can also transfer you from the falls to the campground or vice versa. The walk in to the Mitchell Falls from the campground is about 3 km one way and can take from 1.5 to 3 hours, depending on how much you want to see. The walk passes little Mertens Falls and galleries of ancient rock art which are well worth looking at. The Mitchell Falls coastal helicopter flight can transfer you from the helipad at the top of the Mitchell Falls back to the campground, or take you in and drop you off, as part of this Mitchell Falls Coastal helicopter flight. A percentage of your tour price is paid to the traditional owners of the land.